reward those contractors who demonstrate a commitment to technical excellence via this program. The Franklin Certified Contractor program consists of two primary components: the BASE level program and the EXPERT level program. In the BASE level program, the contractor earns recognition as a Franklin Certified Contractor. Building on that, a contractor may earn an EXPERT designation in Industrial-Irrigation and/or Drives. Once a contractor becomes Franklin Certified, he may add one or more of the EXPERT designations at any time by meeting the requirements. The contractor must be licensed as a groundwater professional in his respective state (if state requirements are in place). The contractor must attend a comprehensive FranklinTECH seminar. This may either take place at the Wilburton, Oklahoma campus or at a designated FranklinTECH On-The-Road (OTR) location. Experienced contractors with 5 or more years of experience in the water systems industry may apply for BASIC certification by “testing out” using the on-line, Certified Contractor Exam. For more details, contact your water systems distributor or Franklin Electric Field Service Engineer or Territory Manager. There is no “test out” exam for the EXPERT level designations. All certifications are valid for two (2) plus years, expiring on December 31. For example, a contractor’s certification that was obtained in June 2012, would expire on December 31, 2014. Solar power continues to spread with massive growth predicted for the foreseeable future. Solar pumping systems are no exception and with today’s growing demand for expert, qualified solar water systems contractors, this can be your distinct advantage over the competition. Team with Franklin Electric to become a Franklin Certified Solar Contractor and an expert at selling and installing Franklin solar pumping systems. Contact your local Field Service Engineer or the Technical Service Hotline (800-348-2420) to arrange a Solar Certified Contractor training event. Where required, be a licensed professional in your state. Certification is valid for two (2) years. A contractor may renew his certification by attending another updated training event. Certification Patch – Franklin Certified Contractors receive a patch for each level of certification achieved. Patches may be affixed to the contractor’s apparel for visible demonstration of his achievement. Program Certificate – Franklin Certified Contractors receive a certificate for each level of training successfully completed. Certificates include current status and expiration date. Recognition Plaque – Key Dealer companies with at least one certified employee receive a plaque recognizing this achievement. Prioritized Web Listing – Key Dealer companies with at least one certified employee will be given precedence on Franklin Electric’s online dealer locators for quick recognition by end users. 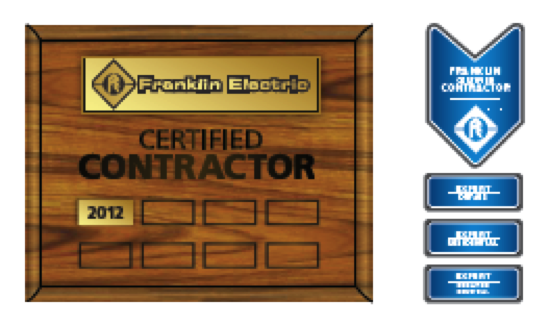 Recognition in Printed Materials – Franklin Certified Contractors and/or their Key Dealer companies may be recognized periodically in Franklin publications. Our industry is constantly evolving with new technologies, innovations, and ideas, so we want to make sure you’re always set up for success. Franklin Electric offers a world-class program to support your business by providing training and certification geared to varying levels of expertise.